Ah, there's nothin' better than fried cheese. I've always loved mozzarella sticks. And I think it's awesome that people then dunk their fried cheese in some form of tomato sauce, usually marinara. Tomato is a fruit/vegetable, right? That makes it all healthy, right? You've got the fruits and vegetables group, the dairy group, and the breading would qualify as a grain. 3 out of the 4 major food groups. All you need to do is toss a sausage or hot dog on your plate, and you've got a balanced meal...or something like that. The sticks came out of the oven with most of the cheese having leaked out of the side of the breading. So there would be this hollow tube of crust with a big wad of slightly-charred cheese right beside it on the baking sheet. And for some reason, they tasted freezer-burned to me. We ate them within a week of purchasing them, the bag was only opened within an hour or so of consuming them, and this was all well before the expiration date. So I'm not sure what happened there. Sonia didn't notice the freezer-burny taste at all, but then, she usually doesn't. We dipped our mozzarella sticks in TJ's Tomato and Roasted Red Pepper Soup. They went well together. I think it worked at least as well as actual marinara sauce would have. Once in the soup, I didn't notice the peculiar taste as much. It was actually really yummy. I was surprised when Sonia pointed out that the breading contained tapioca. 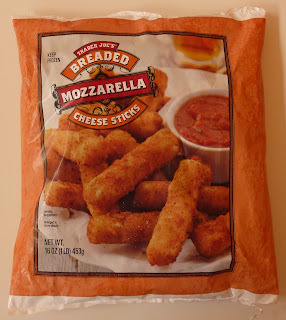 It was still made with wheat flour (sorry, gluten-free peeps) and it was very similar to traditional mozzarella stick breading, although I wonder if the subtle freezer-burn flavor was somehow connected to the use of tapioca...? Not that tapioca tastes like freezer-burn, but maybe somehow my taste buds detected an anomaly of sorts and just defaulted to the "this is just slightly funky" message, which my brain interpreted as freezer-burn...? And perhaps that last sentence is a good example of why I'm a foodie-hack blogger and not a neuroscientist...? At any rate, I still have yet to be blown away or majorly disappointed by any mozzarella stick. Fried cheese is what it is. The tapioca starch was a nice touch I guess, but next time Trader Joe, we're counting on you to blow us away. Try putting marinara sauce inside the tube of cheese, add shrimp or something, cram cocktail weenies into the center of the sticks...for goodness sakes, be creative, TJ's! Entertain us! You do weird stuff better than anyone else. In return for your culinary creativity, we'll love you forever and continue to write this blog. For those of you who've been pestering us for photos of the actual out-of-the-bag food, please click here. You're welcome. Sonia gives these 4 stars. I give them 3. I bought these a couple weeks ago and returned them. I've never returned a TJ's item before, but I was so disappointed. I love mozzarella sticks. Even fairly bad mozzarella sticks can taste good at midnight when you get a craving. But these had a weird sour wrongness that I couldn't get past. I made a second batch a few days later and, even with a few beers in me, I couldn't make myself eat them. So very sad. honestly my mozzarella sticks had the ooze in the mozzarella but it was.. chewy. NOT a good sign. Honestly, I had high hopes for it and I couldn't even gulp down two before concluding that these sticks were not for me. Hmmm...THM, maybe that sourness you tasted was the "freezer-burn" I tasted? Because it wasn't freezer-burn per se. That's just the closest thing I could use to describe what I tasted. It was a shade funky, but to me it was subtle enough to overlook. I was with you on the funky taste! I am a very picky eater so I thought maybe it was just me. All I know is the dogs LOVE them, straight out of the freezer - so my extras sure don't go to waste. I was super excited when these came out and immediately bought a bag. I don't think the baking times or temperatures were accurate. They never seem to get crunchy. You just know when they are ready when the cheese starts to ooze out. I also thought something tasted funky. The cheese taste reminded me of a non dairy cheese aftertaste. I couldn't place the aftertaste, just didn't really like it that much. Tapioca in mozzarella sticks? It's an abomination! But seriously. They are redefining the mozzarella stick and I'm not ready for change. Next time, try frying them. You dont need a whole lot of oil, just a shallow layer to cover about 1/5 of the sticks and turn them constantly. Dont fry them for too long or else the cheese will leak out of the breading. Let rest for about a minute or two, and you wont regret it. This is the best frozen mozzarella sticks I've ever had. I know this isn't the healthiest way to have them, but since they're already fried before, might as well fry them again. They are awesome! I promise you wont regret it. Totally just fried my mozzarella sticks in peanut oil, 4 minutes 350 degrees. They were fabulous! Oooowey gooey cheese inside and crispy on the outside...yum! This is weird because I bought them at my local TJ's after trying them as a sample. They were fantastic as a sample and when I got them home they were great too. I am usually pretty sensitive to sour or strange taste and I didn't detect anything. And my cheese did not melt all out. I had some tiny escaped cheese bubble but nothing that deflated the tube. They were the best frozen mozzarella sticks I have ever had. But I was soooooo sad when they suddenly and quickly disappeard for the store! But judging from this review and the comments I would probably guess there was some kind of error in the manufacturing process that perhaps made them less shelf stable or something. I hope they can fix whatever problem they had and get these back out in stores cause when they were at their peak right when released, they were delicious! I’m eating these right now and they are so good. So unfortunate about the freezer burnt taste. These might be the best mozz sticks I’ve ever had. Last night I ate the entire contents of the bag less 3 of the breaded mozzarella cheese sticks. I am thankful to God for the wife He gave me who preheated the oven, placed a sheet of aluminum foil neatly upon a cooking pan, and afterward ate those 3 breaded mozzarella cheese sticks: one and one-half servings. As I now recall she said they were good, after I asked how they tasted. I suppose that could go without saying because she clearly exceeded the recommended serving size. We added a bowl of salsa, since we still had some in the refrigerator. Certainly I was hungry, as you may have suspected, and their taste was so good as to be rated slightly beyond excellent, but I still wonder about this my consumption that many today, I think, would consider excessive. I don’t want to become overweight or pathologically obese. Am I sorry I ate the whole bag less 3? Yeah, my mind says yes. But, on the other hand, that bag will never again stare into my face and taunt me from the freezer. I won, and he lost. The contents of my freezers cower in fear.